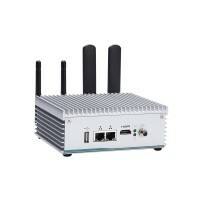 The eBOX560-900-FL employs a NVIDIA Jetson™ TX2 module which has a powerful 64-bit ARM A57 processor; a 256 CUDA cores with NVIDIA® Pascal™ GPU Architecture; 8GB of LPDDR4 memory; and 802.11ac Wi-Fi with Bluetooth. It also supports NVIDIA JetPack 3.2 SDK including TensorRT, cuDNN, CUDA Toolkit, VisionWorks, GStreamer, and OpenCV, all built on top of L4T with LTS Linux kernel. The extremely compact system is your superb choices for AI, deep learning, and edge computing. Its tough construction is IP40-rated, and it has an extended operating temperature range of -10°C to 50°C (14°F to 122°F) and up to 3G vibration endurance.